¶Yeah, I know “Mothers’ Day” is still more than three months away, but I might abandon this blog before May 14 and there are still a few things about my mother that I want to record. ¶Mama was in some ways acutely alert to health matters and in other ways indifferent to them. I remember when I was hardly more than a toddler she took me to be examined by Dr. Fred S. Brooksaler (1901-73), a Dallas pediatrician who later became a professor of pediatrics at Southwestern Medical School in that city and who is still remembered there by an endowed professorship in his name . ¶Once, Dr. Brooksaler performed an in-office operation on my neck just below one ear, but what he removed I do not recall, if indeed I ever heard him say. I liked him a lot because he gave me a little toy every time I visited him. ¶One of the medicines Dr. Brooksaler prescribed for some forgotten ailment was a roll of flat, circular, chewable lozenges that tasted like candy. I liked the flavor, naturally, but Mama said I could take one only after a meal. I had a very broad concept of “meal” in those days, so one day while Mama was away I ate a couple of saltine crackers and then chewed one of the “medicinal candies”. Then I repeated the process from saltines to medicine two or three more times. Later, as I was walking down a sidewalk a few blocks from our apartment, I became violently ill. Fortunately, a lady sitting on her porch across the street noticed me and came over to take me to her porch, where she provided whatever aid she could, not knowing what was wrong. Obviously, I survived. ¶Mama also had me examined and fitted for eyeglasses, although she probably did so at the elementary school’s bidding. They were wire-rimmed glasses, which I hated. (That was back in the days before the Beatles, when “granny glasses” weren’t yet “cool”.) I refused to wear them one spring while I was staying with an uncle down in the Rio Grande Valley. After I got sick at school one day, the nurse concluded it was because I hadn’t been wearing my lenses, so I had to dig them out of the sandy loam of the grapefruit orchard where I had buried them and don them from then on. ¶I don’t recall Mama ever taking me to a dentist’s office, and now I don’t understand that. Dentists are, in my experience, the least expensive of health care providers. How my teeth managed to stay in good condition until age thirty-five (when I underwent a periodontal operation) I’ll never understand. I sure miss those three gold-crowned molars I gave up last year because of all the suckers I used to poke into my mouth. ¶Now to the medicines I started out to discuss. ¶First, there was the Campho-Phenique which was a regular staple in Mama’s medicine cabinet. I often enough required its application because I spent hours on end running around barefoot in the neighborhood lawns, which were the chiggers’ habitat. I haven’t had a chigger bite since I was little, yet, in my earlier adult years, I used to stroll or sit on friends’ lawns or in area parks where the grass was plentiful enough. Nary a bite! Are chiggers extinct? I just can’t believe that! ¶Also in Mama’s cabinet one could find a jar of Mentholatum or VaporRub. These salves were developed in the 1890s and are still used today to aid breathing while a person has a cold or cough. Recent research has indicated that the salve doesn’t actually improve breathing but that its camphor aroma fools the brain into thinking that it does. (What’s the difference?) It ordinarily is applied to the chest and the back. The ill person inhales the cool camphor smell, which has an odor that I like. However, since the positive effect is supposed to be derived from breathing, I fail to understand how applying the salve to one’s back is going to be effective. Anyway, when I was a child Mama applied it to my chest many a time. ¶In 1906, Congress created the Food and Drug Administration to investigate exaggerated and fraudulent claims by patent medicine makers, including Caldwell’s company. Digger Odell’s website Bottlebooks.com, reports that, despite the federal government’s actions, “Dr. Caldwell’s Medicine was still misleading the public about the worthiness of its product. This no doubt was accomplished by well-placed donations and lobbying. With the owners making millions each year they would have been a formidable opponent for the government lawyers. So much so that the product was made continuously from 1889 until 1985.” So, about all that is left of Dr. Caldwell’s Syrup Pepsin are collectible antique bottles and ads. Oh well, I sure did like the taste of that stuff, containing as it did pepsin, one of the ingredients that now goes into Pepsi-Ćola. ©2004, 2016 By Bob Litton. All Rights Reserved. NOTE TO READERS: The article below was written back in 2004. At that time, I submitted it to one of our local weeklies. The publisher/editor never printed it. I did not ask him why, but I supposed, with substantial grounds, that his reason was that it was “soft news”; i.e. material that had no immediate relevance for the populace but was a rather small matter that yet could in fact disturb them— they might avoid their local barbers and dentists. Also, while he puts out the best chronicle in the three-county area in the sense that his reporters cover ”hard news” (governmental, political and social events) more fully and accurately, he doesn’t have much appreciation for feature articles or what used to be called “familiar essays” (a common element in the “Talk of the Town” section of New Yorker magazine), which are my forte. So, this article has been stuck in my files all those years, yet I believe it still makes engrossing matter for the intellectually curious reader. I have altered the names somewhat, reducing them to initials, because I did not have permission from the subjects to include their full names, although they knew I would publish the article sometime, somewhere. Also, the barber retired half a dozen years ago. There’s new news and there’s old news—but they are not always so simply distinguishable. Take for example a recent trip to the barbershop for my monthly trim. I went to K. N.’s barbershop. Usually, one of the other barbers cuts my hair, but on this day I had the honor of K. N. himself shearing my mane. After he had done the basic work, he pressed out a palmful of lather and smeared it on my neck. It had been I don’t know how many years since anyone had done that. “Oh, we’ve got these stainless steel razors now,” he said. “I used to use Solingen steel blades from Germany. Other barbers used Sheffield steel from England. But they both had pores in them that retained blood. Now I use stainless steel. And I use it only one time.” The stainless steel blades, we discovered after looking at a box, are made in the U.S. The State of Texas Barber Board, K.N. told me, sent out new regulations about ten years ago ordering barbers to quit using the porous razor blades. They also had to get rid of their strops and hones. About ten years ago was also when the Center for Disease Control, or CDC, sent out regulations telling dentists to modify their practices in the interest of reducing the potential for transmission of HIV, according to local dentist J.F. The regulations were a response to the case of a dentist in Florida who a decade ago allegedly infected five patients with the AIDS virus, J.F. told me. However, he said, all five cases involved different strains of the virus. My conversation with the doctor about AIDS developed when I went to see him about tender gums. As I sat in the chair I noticed that the ordinary chairside spittoon was missing. “Where’s the spittoon?” I asked the dentist’s hygienist as she was sticking a tube in my mouth. What she had stuck in my mouth, J.F. later told me, is called a high-speed suction tube. It removes all that saliva and blood we used to spit into the spittoon. Also, J.F. said he has a line separator in his alley so that there is no possibility of backflow. So you see how a news story that began back in the early 1980s, when Ronald Reagan was president, continues to ripple into the 21st century. And how our daily lives are continually and probably forever changed in the minutest of ways by the event that created the story. *Fairy: I don’t know how widely the folklore of the “Tooth Fairy” extends, so perhaps I should relate it briefly here. Children’s “baby teeth” begin to drop out at about age six. Generous, loving parents sometimes tell their child to put a dropped tooth under his/her pillow so that the Tooth Fairy can remove it and replace it with a small coin, such as a dime. NOTE TO READERS: In my January 7 post, I related the beginning of a local controversy involving the placement of religion-oriented decals on the windows of county vehicles driven by our sheriff’s deputies. In concert with similar episodes in this state and other states, this incident has swelled into a debate about the “wall between church and state”. Actually, though, such events have peppered our nation’s history almost ever since the U.S. Constitution, together with its first ten amendments, was ratified by the legislatures of the thirteen original states between 1787 and 1791. My homeland is now agitated by disagreements over a few parts of the Constitution. Some citizens, known generally as “strict constructionists” or “originalists”, are in verbal conflict with other citizens loosely describable as “believers in a living, evolving constitution”, over a few sections of the Constitution, particularly those concerning immigration, women’s rights, appointments of judges, and the right to bear arms. The First Amendment issue of separation of church and state is not currently the subject of a national quarrel, but it does pop up occasionally in pockets around the country. The decal debate here apparently is of interest only to a few vocal citizens, including myself; however, the Texas governor has weighed in; and so has the Freedom From Religion Foundation, the latter of which announcing that they would enter the legal fray if any local citizen would file suit in court. Like me, however, most of the people here are not financially able to pursue a lengthy court battle with an undeterminable outcome. And I prefer to fight my battles in the newspaper. Which brings me up to the present. This past week, one of my letters-to-the editor was published in one of the local weeklies. (I did not submit it to the other paper because the publisher/editor there has a bad habit of excising sentences from my letters.) For those of you who were interested in that first letter I re-published on this blog, you might find this one just as entertaining. The brown-and-blue cross decals on sheriff’s deputies’ vehicles here in Brewster County have reportedly attracted the attention of state politicians. Gov. Gregg Abbott, in a “brief” to State Attorney General Ken Paxton, is quoted as saying that ‘the cross has a long history in America and elsewhere as a symbol of service and sacrifice’. I suppose he is referring to the historical practice of burning crosses on the lawns of colored folks, and to those red plus-signs on the sides of Red Cross medical vans. He did acknowledge that the cross does have “its religious significance”. Now, Abbott’s message is what I call a capital case of sophistical demagoguery. A Republican politician who is trying to establish his position early as a religious conservative in preparation for the next gubernatorial campaign, Abbott is diving into an issue that he apparently hopes will give him an advantage with the evangelicals in this state. Brewster County Sheriff Ronny Dodson said at the beginning of this cross decal controversy that he views the sticker as a symbol of the cross that Jesus died on and of the religion that evolved from that incident but that he would allow any Jewish deputy (if he had one) to apply a Star of David decal, or any Muslim deputy (if he had one) to apply a Crescent-and-Star decal. He said he sees the decals as a way of invoking God’s protection for his officers. Therefore, the religious significance of this decal is the primary accent to be interpreted, and as such it amounts to an intrusion of religion into what is supposed to be a non-sectarian government. The religious conservative crowd wants to involve their personal religion into every governmental activity they can. They do not realize what such an approach can lead to. But a bunch of them in Phoenix, Arizona, got a jolt recently when the local Satanist church petitioned to have their turn at giving the invocation at a city council meeting. The nonplussed council members — faced with the dilemma that any officially recognized religious organization must have its opportunity to share in invocation presentations and yet unwilling to allow the Satanists their chance — discontinued prayers at council meetings altogether. I am not an atheist and definitely not a Satanist, but oh, how I wish we had a Satanist church in Alpine! That would be a hilarious scene to watch! And it might benefit us defenders of the doctrine of separation of church and state (Everson vs. Board of Education . NOTE TO READERS: I know I have been presenting bare blog posts the last few months because of physical problems and depression over the national and international scenes. Well, I am back now — sort of — but in a different tenor. My repressed anger is beginning to force itself into expression. I am contemplating a fairly lengthy jeremiad about the world around me, but that will take a while to develop and compose. For the moment, I am involved in more immediate and very local issues. The other night I attended a city council meeting and, with the help of another local activist, convinced the council members that they should be more concerned about the needs and convenience of the citizenry. It was over a fairly small issue — the scheduling of council meetings — that likely would not interest global readers. This morning, however, our two local papers published a letter-to-the-editor I had written protesting the pasting of religious decals on the rear windows of county sheriff department vehicles. That letter, I figured, should be of interest to citizens all over my homeland, maybe even the world. And that is the reason I am publishing it here today. I have expanded it slightly. I hope you find it interesting, even provocative. I hear the Brewster County Sheriff’s office has received more than 1,000 comments on their web page applauding the sticking of religious-oriented decals on their vehicles, and only a few condemning the practice. Well, I think the 1st Amendment to the U.S. Constitution, which prohibits the favoring of any religion, is very important. I will be as fervid in my defense of the 1st Amendment as the NRA gun-runners are absolute in their espousal of the 2nd Amendment. The vehicles driven by our state, county and city law enforcement agencies are purchased with money coming from taxes paid by ALL the citizens of those jurisdictions. And not all the citizens are Christians; many are not even religious. What is the message intended by the decals with their white over tan crosses and thin blue lines intersecting the horizontal bars? Are we to interpret them to mean that if you are a Christian you will be treated preferentially by the officer driving that patrol car? When he or she pulls you over for driving too fast or recklessly and you inform him/her that you are a Christian, will he/she give you a warning ticket and wish you a merry Christmas? I am not so rigid in my insistence on the separation of church and state that I find “Merry Christmas” greetings repugnant; the political correctness notion has its own extreme. Nor do I see anything wrong with Sunday school classes holding Easter sunrise services at public parks where beautiful natural settings are most available, for those services last only a couple of hours and then the folks will depart. Such gatherings are private and relatively isolated and presumably no proselytizing will go on there. But setting up crèches on courthouse lawns or hanging a bunch of paintings of angels in the county clerk’s office (as they do in Ward County) is promoting a particular religion. And a few decades ago, the Monahans, Texas, school board granted the First Baptist Church there permission to use the school district’s multi-purpose building for a revival. Those practices are repugnant and can even be viewed as bullying. — Excerpted from Friedrich Nietzsche’s The Gay Science, Book Second, §93, translated by Thomas Common (Nietzsche’s meaning of “gay” is “joyful”, not “homosexual”). Wha’d I tell you? It’s been only a month and here I am again, typing out a blog post. And what have I been doing in the meantime? playing Solitaire, just like the indifferent lover in Karen Carpenter’s song. So, leaving off the blog did not equal leaving off the computer. I am gathering the notion that my only viable alternatives are chains or a lobotomy. Actually, though, I did learn a few lessons through my time among the cards: that playing Solitaire-to-win requires perserverance, and that I am an impatient student; that although Solitaire is basically a game of chance—more so than Free Cell anyway—there often is some wiggle room for strategy; that it is extremely frustrating when a bunch of small-digit cards (2’s and 3’s) or the royalty cards dominate the bottom row when they are first spread (nothing more useless than a “2”, and yet two or three of them often appear face-up when the cards are laid out); that the prospect of losing is essential to enjoying the game; and that Solitaire is addictive, so much so that I ran back to my blog to escape it. Well, it’s summer now in my little hamlet. Most of the pecan, pear and oak trees survived a severe wind and rain storm here a couple of months ago; a few large limbs crashed, and even some old trees and a few young apple trees had to be put to sleep. But the vast majority of trees have leafed out fully. The daytime high temperatures range from the mid-eighties to the lower nineties so far; they will probably dance around the low one-hundreds before the summer is over. A mockingbird croons occasionally—too seldom, as far as I am concerned. The mockingbird population in this part of the state is minimal compared to North Central Texas, where I come from. I love to hear the clear, varying notes of the mockingbird: it is the adopted mascot…of, say, my Solitaire team. Perhaps I just never noticed the local cicadas before—though I find that hard to believe—but for the first time in thirteen years here I have been hearing their loud clicking, what we called the locust’s song during my childhood. You know, of course, that there is a big difference between the cicada and the locust, for the real “locust” is actually the grasshopper of biblical scourge fame. The cicada’s mating and alert calls are not “pretty” like the mockingbird’s, but they are amusing at least. To us kids in Dallas, the cicada was one of the fun events of summer. They are funny to look at—though they can be scary under magnification—and they are easy to catch. We used to climb up a small tree and grab one off a limb, tote him to earth, tie a thread noose around him, and then toss him into the air, where he would swirl around to our great amusement, just like a tiny kite or a model plane. But, like I said, I had not heard one in decades until this summer; I had come to believe that the oil companies had exterminated them. I had also come to believe that the oil companies drove the fireflies (a.k.a. “lightning bugs”) into extinction, for I haven’t seen any of those in decades either. However, a really dark night is required to see the alternating beams of a lightning bug, and, even in this remote place, we live in virtually endless light. Also, I am no longer a creature of the night, retiring about 9 o’clock each evening, provided the neighbors will allow it. And twilight lingers after nine. You realize, don’t you, that with each year gained in age comes a complementary ability to spot flaws in individuals, in society…dang it!…in the world itself. Well, I haven’t escaped even that undesirable aspect of accumulating years. Sometimes, however, it is difficult to tell whether a particular flaw in our environment is new and truly awful enough to warrant castigating. I am inclined to believe that one among many modern phenomena deserving of a good thrashing is our use of the word should and its synonyms: ought to and need to. Now, I admit that I use these terms frequently enough, especially when engaged in soliloquies about what I have failed to do, have overlooked, or am scheduling. That is bad enough, but when I see the term used extensively and every day on the Internet programming sites, I get really annoyed by it all: “Ten foods you should not eat”, “Twenty places you should visit before you die”, “Why you need to explain to your children the reason they have no daddy but two mommies”, etc. Often, there is a whole page lined up with such article titles. It all brings to mind images of “Big Brother”. Now, don’t chastise me! I know I have used in this post the very word I want everybody to expunge from their vocabularies. Just goes to show: I will never meet the qualifications for “Big Brother”, although there is still the opportunity open to me for the presidency of this great nation. 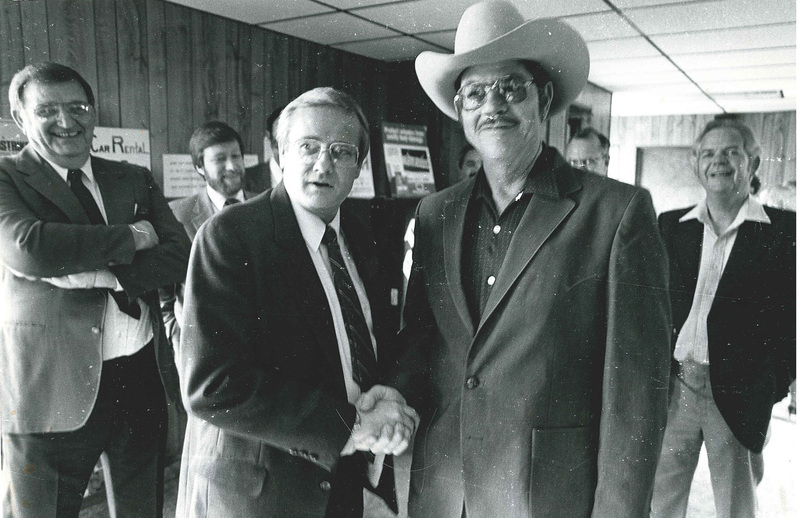 Democrat Ron(ald) Coleman (U.S. Rep. for 16th District of Texas from 1983 to 1997) is greeted at the Monahans airport by Waylan Martin (under hat), chairman of the Ward County Republicans. I confess to tricking the two into the “photo op” because of their contrasting political allegiances, but I also wanted to get the two together to work on the water conservation issue. NOTE TO READER: For those who have not discerned as much by reading through my blog posts, the ones even tangentially referencing politics, I am a liberal down to the marrow. Therefore, I tend to vote as a Democrat, although there have been times in the past when I voted for one or two Republicans in statewide races because they seemed to be best qualified for whatever posts they were seeking. However, since 1980, and even more so since 2000, I have been so angered by Republican policies and tactics that I have voted a straight Democrat party ticket. I have painted the Republicans with perhaps an overly broad brush, judging the ones in power as oligarchists and their supporters as either of the same ilk or as gullible fools. During my turn as editor of the Monahans News, in the early 1980s, though, I met a Republican gentleman who was exactly that: a gentleman, and a good-natured one at that. His name was Waylan Martin. At the time I met him he was a member of the county hospital’s board of directors. It was, of course, one of my duties to attend that board’s meetings and report them in the paper. Waylan and I became good friends—in fact, he probably was my best friend; that position is hard to measure absolutely. We had coffee together most mornings and we occasionally went flying in Waylan’s four-seat plane. Waylan was also the chair for the Ward County Republicans. I teased him about that a few times, but mostly we did not let politics get in the way of our friendship. In retrospect, I now marvel that politics did not injure our relationship, because I never blushed at raking the Republicans over the coals in my newspaper column. One issue Waylan and I definitely were in agreement on was the need to protect and enhance our water resources. We especially were in tune to the idea of canals from the Missouri River into Texas, with several reservoirs in between, in order to make the best use of flood waters. (The Ogallala Aquifer extends from South Dakota into the northern border of the Permian Basin, where we lived.) Beginning in 1977 and continuing into the early 1980s, the U.S. Army Corps of Engineers did a cost/benefit study of such a canal system and derived an estimated cost (in 1977 dollars) of $3.6 billion to deliver 1.6 Million acre feet per year to western Kansas and $22.6 billion per year to deliver 6 million acre feet to the northern panhandle of Texas and the panhandle of Oklahoma. Congress never approved the project. Waylan closed his water lab sometime in the 1990s in order to retire and move to Plano where his daughter resided. He died about a decade ago, I believe. The lab building is still standing—vacant. Yes, Waylan was my friend, even though he was also a Republican, for that was a time when Republicans and Democrats could still agree on some matters at least. Martin, a native of Barstow, has been in the water analysis business for the past 27 years. To prepare for his career, he studied at Baylor, where he received his bachelor of science degree in 1949, and then went on to the University of Texas at Austin for a master’s in bacteriology, completed in 1951. According to the water expert, during the completion of a new well, the additional water can derive from any of five sources: acid water, drilling brine, frac water, load water and natural water. Most of the water sources can be tolerated for a while; it’s the “natural water” which scares oilmen because its supply could be permanent. However, the biggest problems in oil wells is not the water that comes out with the oil but the “suspended matter” that remains in the fractures in the rock and can plug up the oil sources there. “Suspended matter” includes paraffin and asphalt particles, silt, sand, iron sulphide, iron oxide and others. When Martin determines that some farmer or rancher has house water contaminated with bacteria, he suggests sterilization. If that doesn’t stop the problem, he suggests plugging the well with cement and digging another one. Waylan Martin opines that we will continue to have contamination problems with water as long as we are reliant on wells to supply it. “What I would like to see is a canal from Montana or even Canada all the way along the slope of the Rocky Mountains into South Texas,” Martin says. “They’ve got more water up there than they know what to do with, and it’s all going into the Mississippi and into the ocean. As long as that river is a cheap means of travel for barges, there won’t be any such canal built. They’ve got a powerful lobby. NOTE TO READERS: This essay was originally published in the Monahans News under my “Just Between You and Me” column for March 20, 1980. It relates to the events surrounding the assault on the American embassy in Iran. However, while looking over this and other old writings in my files, I was struck by the uncanny resemblance to our current involvements in Afghanistan, Iraq and Syria. However, America did not really have an articulate voice until Walt Whitman. And, for me, what was most peculiarly American in Whitman’s expression was his insistence on being a person of contradictions. He did not blush at such an admission, but rather proclaimed it. I think that quality of being an American makes it easier for me to accept contradictions within myself, especially in regard to my attitude toward my country. Right now, for instance, I am both proud of the U.S.A. and embarrassed for us. I am proud because, in spite of aggravation and incitement, we did not react with military force against the Iranians when they took over our embassy there. Some claim, and probably correctly, that such assaults don’t happen to the Soviets because nationalistic terrorists realize the Soviets would not hesitate to sacrifice their own countrymen in order to save face. To a degree, that is what they are doing now in Afghanistan. To argue that we should do likewise—i.e., act like brutes to achieve at least a grumbling respect—is to say we ought to forgo our notions (or ideals?) of developing a civilized world. If a person who cherishes his own honor succumbs to a temptation to act dishonorably because he realizes his opponent has no intention of acting honorably and therefore is likely to prevail, then he who compromises will have already lost part of the contest, because he will be allowing the opponent to dictate the terms by which it is to be fought. I’m not claiming we have not acted as brutes before. We have. But, we are also growing as a nation, and I choose to look on certain sorry episodes in our history as teething stages in our maturation. The very fact that we publish those episodes is an index of our maturation. The embarrassing aspect of the Tehran captivity is that we are allowing the Iranian militants to siphon every ounce of publicity possible out of it. In a manner similar to our mercurial economic news, newspapers grab up every new note of hope and disillusionment. It seems that every time the Iranians see their great moment slipping from page one to the inside pages they pull some new publicity stunt to retrieve their position on page one. AND WE LET THEM DO IT!